This has most definitely been an interesting first week back into reality. Here in Chicagoland we've had subzero temperatures most of the week, putting it in the negative double digits with the windchill factored in. Plus, we received our first decent snow fall of the winter season. I'm so looking forward to next week when it's forecast to warm up, we're going to be in the 20's! It's going to feel like a heat wave! 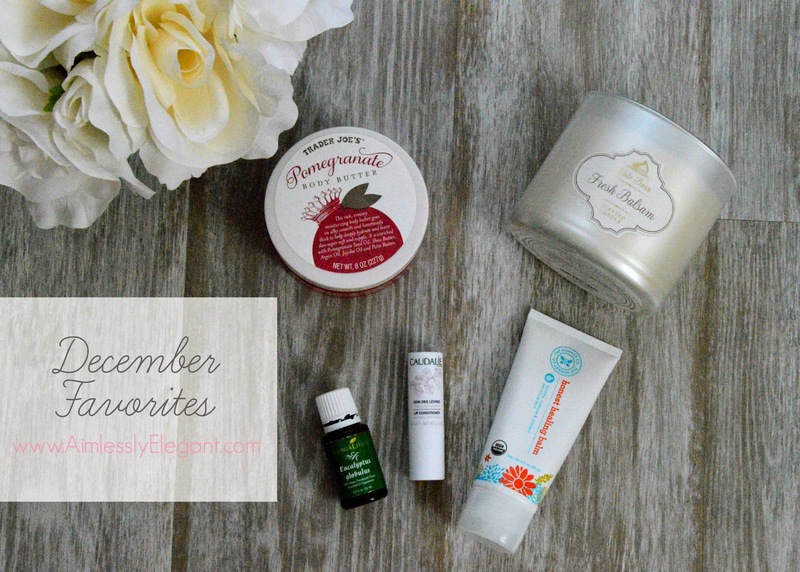 Since this week got the best of me, today's post is a little combination of my Friday Five and my December Favorites. Here's a look at some of the things I was loving in December. I've only spotted this once at Trader Joe's, and I'm so regretting not picking up more than one. The consistency is a little jelly like almost, but it's so moisturizing and nourishing with the greatest scent. Don't get me wrong, I love the coconut version. But this has just a slightly sweet scent, not too over powering. Apparently you can buy it on Amazon for about 3 times what it costs in the store, so if you spot this gem swipe it up because who knows when you'll see it again! I have mentioned these candles several times already, but I seriously couldn't get enough the whole month. Every time I was home I had these candles burning, and everyone that's been over, or that I've gifted one to has absolutely loved it too. It makes up for not having a fresh Christmas tree, and the best part is, usually you don't notice the smell of the fresh tree after awhile, but every time you burn one of these you get to enjoy the scent of a fresh tree. I added Eucalyptus oil to my collection this month and couldn't be more happier that I did. This oil smells just like Vick's vapor rub, and it helps with congestion which always sets on for me in these colder months. Sometimes just breathing it in out of the bottle does the trick, other times I will just leave it diffusing and it helps clear me up. I've been wanting to try anything Caudalie after hearing great things about it. I ended up with two of these Lip Conditioner's after Christmas and love them. I keep one upstairs and one downstairs and I'm applying them all the time. They are really silky soft, almost buttering, and super nourishing on the lips. I got a few other Caudalie products with them that I'm excited to give a try. With the colder weather comes the drier weather, and when that happens my eczema tends to kick up with some pretty good dry patches. I love this stuff because not only is it all natural, it's super thick and moisturizing. It's based with bees wax so it has some serious staying power and helps transform my try scaly patches back into normal looking skin. If you want to give the Honest Company a try you can sign up here for a free starter kit, the Home Essentials includes a sample of the Healing Balm, and truly I've loved every product I've tried from them. What have you been loving recently? I hope everybody has a great weekend, and is warmer than me! Great favorites this week!! I need to check some of these out! I got one of those candles on Black Friday with a special deal -- not balsam -- but I LOVE that candle and have been burning it constantly (even though I got it in November, I just pulled it out a few weeks ago). I'll definitely be watching for more deals on those candles -- and I'll have to try balsam next :) -- Oh I just checked the link and it looks like it's 50% off right now! That body butter sounds amazing!! I love the pomegranate smell! Is the background in the photo your floor? If so, I love it! Yes! Love Young LIving! So excited for 20 degree weather on Sunday!!! It's been so cold and snowy all week! I really love all their stuff, and the bundles are such a good deal! Thanks so much for letting me know about the link up, some how I missed that! I will check it out ASAP! I know, I saw that too- that's the time to stock up, can't beat 50% off! It is so good, I hope for it every time I go to TJ's, no luck yet! It is my floor, thanks! I'm kind of obsessed with it! I feel like I still have so much to learn with the EO but I'm loving everything so far. Bring on the heat wave! I often have to go into my account and push back my order date, but I feel like the bundle is such a good deal! Lauren is traveling and didn't have a chance to do a post about it, but she announced it on her FB and will be doing a post next week. I've heard great things about the Honest balm! Plus, love that you can try it easier because it's at Target now. Thanks for linking up with H54F! I wish there was an "add this to my cart" option with your favorites! I love reading everyone's monthly favorites for beauty. I haven't seen that moisturizer at my local TJs, but this Christmas they had lotion sets that were dupes for the L'Occitane hand creams. They were amazing! I'll have to hunt my TJs for this body butter now. Thank you so much for linking up with H54F! Hope to see you again this Friday! I've loved them all, and I think the bundle is such a great deal! It's nice that you can pick them up in the stores now, but the best value is in the bundles, it cuts the cost significantly! That would be awesome and dangerous if there was an "add this to my cart" option! I love the little gems at TJs, I'm always keeping my eyes peeled! I need to check out the Honest Company. My son has terrible eczema and it's hard to find anything that works. Thanks for the tip! Also, I hope you'll hop over to my blog (www.brightonabudget.com) and link up for H54F:) My friends and I are carrying on the H54F torch for the Lauren Elizabeth and would love to have you link up! Since it's our 1st week, we're doing a $100 Target giftcard to 1 of the bloggers who links up with us! Hope you'll join in! The Fresh Balsm candle is probably my all-time favorite - such an amazing scent! I clearly need to try some products from the Honest line. Everybody raves about it!